Civilian dies in Egyptian capital as protesters mark the second anniversary of the army's overthrow of president Mohammed Morsi. A civilian was killed on Friday during the clearing of a demonstration in Cairo, the Egyptian health ministry spokesman told Reuters. 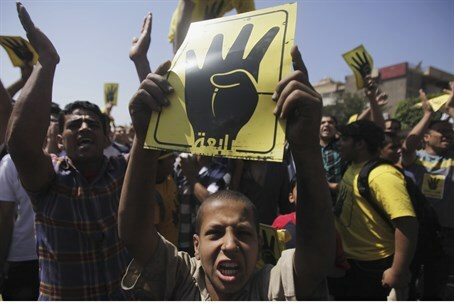 The demonstration marked the second anniversary of the army's overthrow of president Mohammed Morsi following mass protests in 2013. According to Reuters, the protest took place in the southern Cairo district of Dar al-Salaam but the circumstances of the person's death were not immediately clear. Several weeks ago, an Egyptian court upheld the death sentence handed down to Morsi in one of many trials he is facing following his ouster. The former President is also accused in a separate trial of inciting the killings of opposition protesters outside the presidential palace in December 2012.